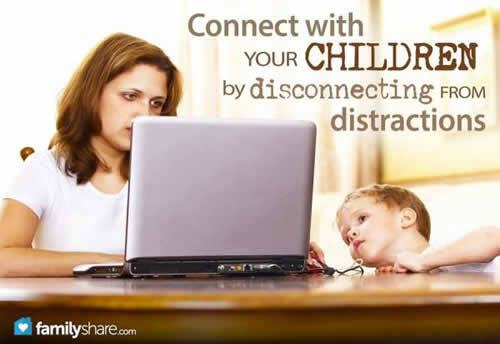 Connect with your children by disconnecting from distraction . 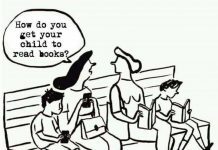 Children need the attention of their parents, but technology is a constant distraction! The lure of gadgets like iphones, ipads, blackberries etc along with the rising use of internet, addiction to social media (facebook, twitter etc.) & humongous information flow is gradually creating a distance in relationships. Now, Many no longer like to wish or talk in person on special occasions. They are happy to wish via sms or a 140 character tweet. Parents are finding increasingly difficult to spend time with children. Earlier – in the pre social media days, the spare time was used to spend time with children – teach them in their studies, play with them or just listen to the happenings in their world. However now a days all that time is being eaten up by swanky gadgets. There is no more time time left for children. Parents are happy to splurge on gadgets for their children. 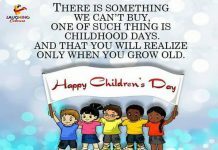 Spending time with children DOES NOT only mean taking them out for a movie or eating out in a fast food restaurant of their choice. Of course this is time spent with them, BUT definitely not quality time. Remember, Children need your time and attention more than anything else. They are growing up. Spend time teaching them, listening to their stories and gossips. Try answering their innumerable simple questions (like What should I become when I grow up? )~ the answers to which are definitely not easy.